I have said before that my husband is a huge fan of all Tex Mex food. I swear he could eat tacos everyday. This is one recipe that he makes that I absolutely love, even though I am not that into Tex Mex. This recipe is not spicy, because I am a wimp when it comes to spicy food. I will add in some options if you want it a little hot. Last week, in our co-op, there was an option to buy 48 ears of organic and non GMO corn. We jumped on that deal and have it tucked away in our freezer. We used some of that corn in this recipe. There is nothing like the sweet taste of corn on the cob. It reminds me of summer just like watermelon does. Yum! Cook the rice or quinoa according to the package instructions. I actually always have some kind of a grain cooked in the fridge that I can add to meals to stretch them out. In a large sauce pan , saute the onions, beans and spices in your oil of choice. When onions begin to soften, add corn, rice and lime juice and cook an additional 7 minutes or so on medium heat. That’s it. Now you can create the taco with whatever fixings you like. We use Food for Life sprouted corn tortillas, add in the cooked mixture, tomatoes, avocados, cilantro and cheese of your choice. We use our dairy free cheese sauce and it tastes awesome with this recipe. Enjoy! We love your tacos too! What about the shell? What do you use for the taco shell? PS. Love your blog! I'm a daily follower! I mentioned it in the post. We use Food for Life Sprouted corn tortillas. They are vegan, organic, gluten free and contain only 3 ingredients. And they are not only so delicious but far far more nutritious than the usual junk in the typical grocery store or restaurant. When you said Organic and Non GMO corn; isn't all Organic Non GMO? Can you have Organic food made with GMO's? Yes, that is usually they case, but some foods are actually non GMO verified by a third party. I'm with your husband one this one - we love Tex-Mex food, too! These look delicious, and so easy! I love that each family member can adapt the flavors and heat level through the toppings - everybody's happy! I hope you enjoy my recipe. I personally love mine with my dairy free cheese sauce and extra avocados. Easy meals are the best. These look great! I haven't had tacos in forever! These look delicious! I'm with your husband- I could easily eat tacos for every meal. I already had a breakfast taco today with eggs and homemade guac! How would we make it spicy if we like it that way? Probably could add some jalapeños or red pepper flakes. Any suggestions? I added some optional ingredients in the recipe. Cayenne and jalapenos. Red pepper flakes would be great too! Yay for Tex-Mex! That is easily my favorite as well. Yum. I put avocado and salsa on just about everything! You can try broiling them as they are draped over an upside muffin pan. That would make them like crunchy cups. Okay, thanks. I also noticed that the Garden of Eatin' was on your list of trusted brands to buy. Do you only buy this brand if it is USDA organic or is it okay that only the corn flour in the shells is organic? I would say it's okay to buy if it's been non GMO verified. We're making these tonight but using purple cabbage leaves instead of taco shells!! What is the dairy free cheese sauce you use? I've been looking for cheese substitutes. This is a keeper recipe. So easy and so delicious. The only problem I had was getting the sprouted corn tortillas to crisp up - I put them in the oven on a rack thinking the heat could get to both sides - they got somewhat crispy but didn't stay that way - they were actually kind of tough. Other than that we loved the tacos. Great flavor! Served them with scallions, chopped tomato and slices of avocado. YUM! Thank you! 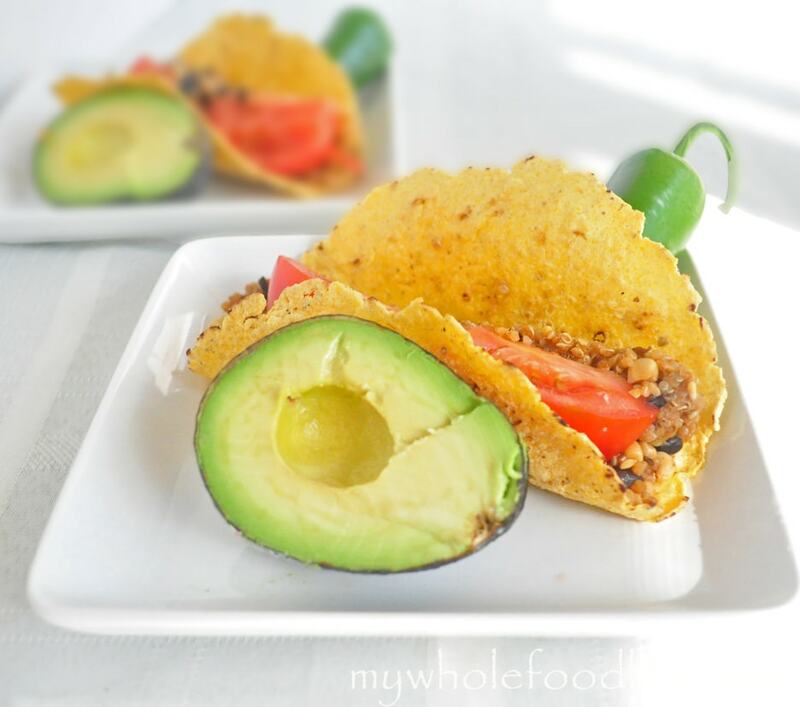 Making these tonight with my homemade whole wheat flour tortillas! Very excited. Oh yum! I bet that will be delicious!